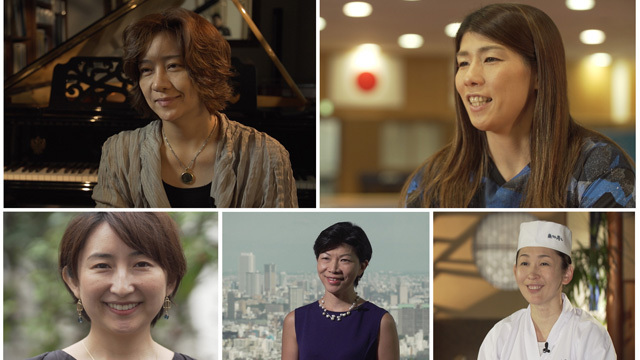 This month CNN’s ‘Leading Women: Japan’ meets five women who are taking Japan forward, and making a difference in their respective fields. A country of finesse and tradition, with innovation at the heart of its soul, Japan’s impact has been felt all over the world. But as the country deals with a falling birthrate and maintains a restrictive immigration policy, some say it is the women who will play the most crucial role in its future. In this special 30-minute program, CNN features Goldman Sachs vice chair Kathy Matsui, award-winning sushi chef Yumi Chiba, world renowned conductor Tomomi Nishimoto, Japan’s first ethical jewelry designer Natsuko Shiraki and three-time wrestling Olympic gold medalist, Saori Yoshida. Kathy Matsui was credited by Prime Minister Shinzo Abe for coining the term “Womenomics” and published the first report on it in 1999 arguing that equalizing roles in the workforce was a better solution to Japan’s shrinking labour pool. She is American-Japanese, a breast cancer survivor, and was named top Japanese equity strategist by Institutional Investor magazine for three years. Yumi Chiba is a sushi chef and president of Anago no Uotake Sushi. She followed in her father’s footsteps as a sushi chef, a position that is mostly filled by males, and is still seen as an almost entirely male dominated art form. She has been in the sushi business for more than 16 years but says sushi has been a part of her life for as long as she can remember. Tomomi Nishimoto is the Artistic Director and Principal Conductor of the IlluminArt Philharmonic Orchestra. She has conducted many famous Japanese orchestras and has received multiple awards. She also had a professional stint in Russia when she conducted the Saint Petersburg Philharmonic. It was during a trip to India Natsuko Shiraki was inspired to create HASUNA, a jewelry company which focuses on designing and creating ethical jewelry using fair trade materials. It is the first of its kind in Japan – when she set up the brand, the term ‘ethical’ was not yet recognized. Undefeated for more than 10 years, three-time Olympic gold medalist Saori Yoshida is one of the most decorated freestyle wrestlers in the world. Many call her a living legend, not only winning 13 straight world titles, she also won three consecutive Olympic golds. In the lead-up to the 2020 Tokyo Games, she’s taken over as coach for the Japanese women wrestling team – with many wondering whether she’ll chase her fourth gold medal in her home country.